This year America’s Fourth of July Independence celebration will be shared with hundreds of other countries and countless guests on the other side of the world at EXPO 2017 here in Astana, Kazakhstan. Since June 10 our USA Pavilion has opened its doors to Central Asia’s first World’s Fair, welcoming guests from all over the globe to see how the United States is driving towards the future of energy through American innovation. On July 4, the USA Pavilion cordially invites the world to join in our celebration. Fittingly, the Fourth of July is not the only important celebration at the Expo 2017 World’s Fair this week. On July 6, Kazakhstan celebrates the 19th annual anniversary of naming Astana capital of Kazakhstan. It is a beautiful capital city (and quickly becoming my second home). It truly is amazing how Astana transformed from a new-born city to the host of this year’s largest global event in such a short time! It is fortuitous that our two nations, the United States and Kazakhstan, share crucial holidays so close to one another. Since Kazakhstan’s independence over 25 years ago, our two nations have accomplished a great deal together through mutual cooperation and respect. Now, the USA Pavilion serves as a physical testament to the strength of the U.S.-Kazakhstan bilateral relationship. The theme of the USA Pavilion, inspired by the general Expo theme of ‘Future Energy’, is anchored by the idea that the source of infinite energy is within all of us, manifesting as the energy that spurs innovation to do amazing things. 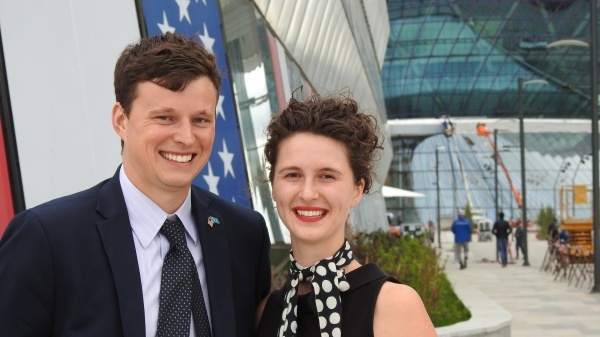 Ultimately it was the energy of the relationship between the United States and Kazakhstan that powered the USA Pavilion from dream to reality. Driven not just by our political leaders but our private sector and peoples, the partnership between the United States and Kazakhstan has only grown stronger as a result. Maintaining a robust partnership with Kazakhstan is extremely valuable for American interests abroad. Kazakhstan’s markets are becoming increasingly attractive as economic liberalization continues, the nation’s significant energy resources, geography and demographics places it literally in the center of the world along with its critical role in the continued fight against global terrorism. Kazakhstan’s role in security specifically will only continue to grow, as evidenced by its ascension to the UN Security Council as a non-permanent member in 2016. This historic recognition (the first time a Central Asian nation has joined the UN Security Council) only increases the importance of Central Asia at the General Assembly. A close relationship with the United States is also very valuable for Kazakhstan. The Central Asian nation has made admirable efforts to liberalize its growing economy, and the United States, as the largest liberal economy, is the perfect partner to boost Kazakhstan’s international trade. Increased American investment would significantly expedite the high standards of growth of Kazakhstan has set for itself, while American businesses are natural partners to increase the ease of doing business in this emerging market. Kazakhstan’s ability to bridge various worlds and paradoxes makes America, despite its geographic distance, a natural partner along with other important stakeholders in the region for the heart and soul of Eurasia and the ancient Silk Road. I encourage all of Expo’s visitors to come and be inspired by the power of human energy this summer at the USA Pavilion in Astana, while remembering that the only reason the USA Pavilion stands at all is thanks to the friendship between Astana and Washington. Concrete and paneling are not the foundation of the USA Pavilion; the building’s true bedrock is the vital relationship between the United States and Kazakhstan. Happy Fourth of July, and happy Astana Day!